NEW YORK (AP) It didn't take long for Chris Davis' first benching of the season. 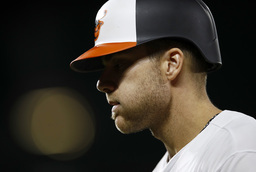 The first baseman with the $161 million contract was out of the Baltimore Orioles' starting lineup for a 5-3 win over the New York Yankees on Saturday, two days after going 0 for 3 with three strikeouts in the opener. "Paxton is a tough left-handed pitcher, obviously," Hyde said. "I want to play as many guys early as I can, also." "It's not going to be a set where if a left-hander is starting, these guys are sitting," Hyde said. "It's going to be more matchups and splits."